Within the heart of the vibrant Crossroads District, stands the nearly 120 year-old Emery, Bird, Thayer Co. Warehouse building, known today as the EBT Lofts. The structure is noticeable through its sienna-colored bricks and large proclamation of its place in Kansas City history. The EBT Lofts consists of six stories with a grand collection of one and two bedroom floorplans, with washer and dryer. 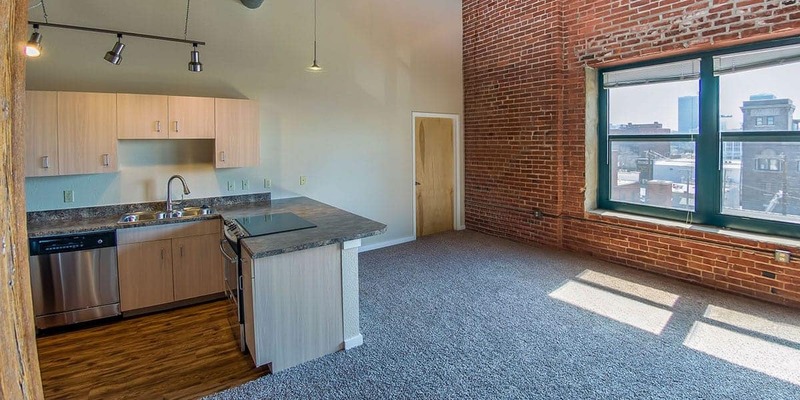 Due to its central location, the EBT lofts have spectacular views throughout and all units feature heavy timber ceilings and colorful brick walls. Community amenities include a full fitness studio complete with a sauna and a Social Lounge. Security is covered at EBT by a courtesy patrol, secured entry and gated parking is also available for rent to residents. Nightlife spots, desired restaurants and trendy destinations are in close proximity to the EBT Lofts. During warmer months, Kansas City residents flock to the Crossroads District to experience “First Fridays”, where every first Friday of the month features food trucks, performance art, exhibits and live theater productions on public streets and sidewalks. Additionally, the breathtaking Kauffman Center for Performing Arts is located to the west and the Power & Light District sits just to the north. Streetcar stations along Main Street are available two blocks to the west. With its considerable historical Kansas City lineage, location and gorgeous interiors, the EBT Lofts showcases what cosmopolitan living is all about. *To receive one month free rent applicant must qualify and sign 13 month lease agreement. This offer will expire 2/28/2019.